Opium poppy cultivation levels in Afghanistan approached the highest levels ever recorded last year despite the counter-drug efforts of the U.S.-backed government, the State Department said Monday. The department's annual report on illicit drug activities worldwide said criminal financiers and narcotics traffickers in and out of Afghanistan have taken advantage of ongoing conflict and the fragile security situation. They have "exploited poor farmers in a rural economy decimated by war and drought," the report said. It said drug-related corruption at the provincial and district levels is believed to be pervasive. It added that at the national level, corruption of officials is believed to be much less of a problem. 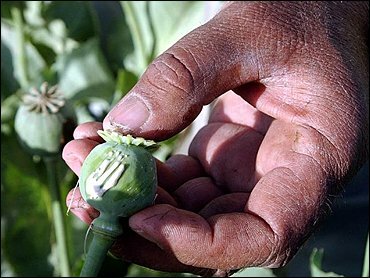 Opium poppy is the raw material for heroin. Robert B. Charles, the State Department's top counter-narcotics official, said the Afghan government under President Hamid Karzai should not be held responsible for the situation. Charles told reporters that Karzai's commitment to curbing narcotrafficking is "rock-solid." Hailing the progress made since the United States began large-scale counterdrug assistance to Colombia almost four years ago, Charles said "the true tipping point" signaling a breakthrough in the war against cocaine there is approaching. He cited stepped up eradication efforts and the "zero-tolerance" policies on drug trafficking of President Alvaro Uribe. Charles said coca production in Colombia, Bolivia and Peru underwent a combined 8 percent reduction last year. According to the report, Colombia still has a long way to go to achieve victory in the narcotics war. "Despite dramatic progress in the narcotics trade, Colombia remains a major producing country," the study said. Although Burma's opium poppy production declined in 2003 for a seventh straight year, the country remained the world's No. 2 producer behind Afghanistan. It also remains the primary source of amphetimine-type stimulants in Asia, producing hundreds of millions of tablets annually. Haiti's geographic position, weak institutions and subsistence economy have made it a key conduit for drug traffickers transporting cocaine from South America to the United States. "The Haitian National Police lack discipline and is riddled with corruption," it said. Mexican authorities "maintained a sustained and intensive counter-narcotics effort throughout 2003, including the capture of major drug cartel figures and the seizure of large quantities of illicit drugs."